Put Date Night First. Schedule your relationship first on your priority list and commit to at least one date a month. Work everything else around that date. It’s all about getting some dedicated, quality time with your Love – enjoying a new experience together or having some meaningful conversation at least once a month. It works. 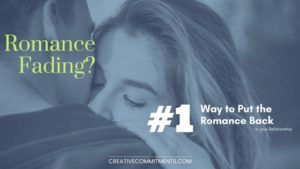 Create a Date-a-Month Calendar or Journal at CreativeCommitments.com that can start on any month and commit to a date a month!